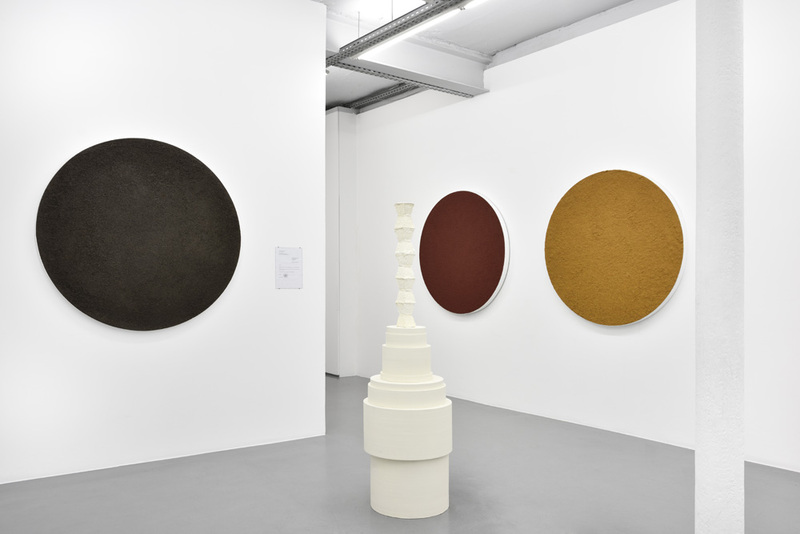 At first glance, Nicolas Boulard’s works seem part of a specific heritage, that of minimal art and conceptual art. The forms are geometric, circles, spheres, polyhedrons. The artist gives great importance to the void, to space, to time and geometry. However, in going closer to the works, the viewer perceives other information that comes from the living, the sentient world. Soil, cheese, water, wine are combined with strictly geometric forms. Nicolas Boulard takes samples from different landscapes to create improbable encounters. His entire approach functions in this way, through the encounter, the assembly of antipodes. The works then express a synthesis, a collision between minimal art, conceptual art, appropriationism, land art, dada, fluxism and surrealism. From Donald Judd to Hamish Fulton, by way of Jean Arp, Richard Long, Dan Flavin, Constantin Brancusi and Joseph Kosuth, he takes hold of forms and protocols to give them new translations. Mobility gives rise to a relationship between his body, the place in which he finds himself and the plastic process that will give an account of a singular experience. The method encounters the sentient. Nicolas Boulard takes samples of water to givee an idea of his excursions and his drifts. He brought a sample of water from Lake Geneva back to his studio. The water is presented, as is, between two framed glass plates. As time passes and the weather changes, it evolves, microorganisms develop, condensation appears, an ecosystem is installed. Barely perceptible, the water forms a line, a symbolic horizon. The work constituted the first step of a series in which the artist applied himself to collecting water from the landscapes photographed by Hiroshi Sugimoto. Nicolas Boulard himself visits landscapes or sets up a cooperation network so that the water samples are sent to him. The original images are reduced to the essential. Water becomes a projection space. The same is true of the work formed by soil. On the wall, the diptych called Antipodes brings together two wood circles covered by soil, one ocher, the other a more reddish hue. The son of wine-growers, Nicolas Boulard is attached to the living, to landscapes, gestures and the senses. 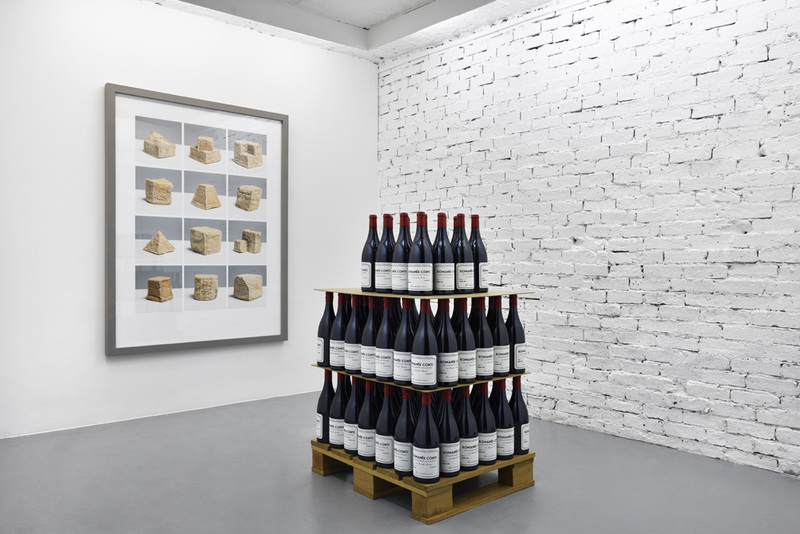 Through his works, he assembles territories thought of as contradictory, starting with the exhibition itself, since it has the same name as the pub next door to the Eva Meyer gallery, The Quiet Man . Guy Debord and Robert Filliou accompany him. 1 Debord, Guy-Ernest. “La théorie de la derive,” in Les Lèvres nues no. 9, December 1956. 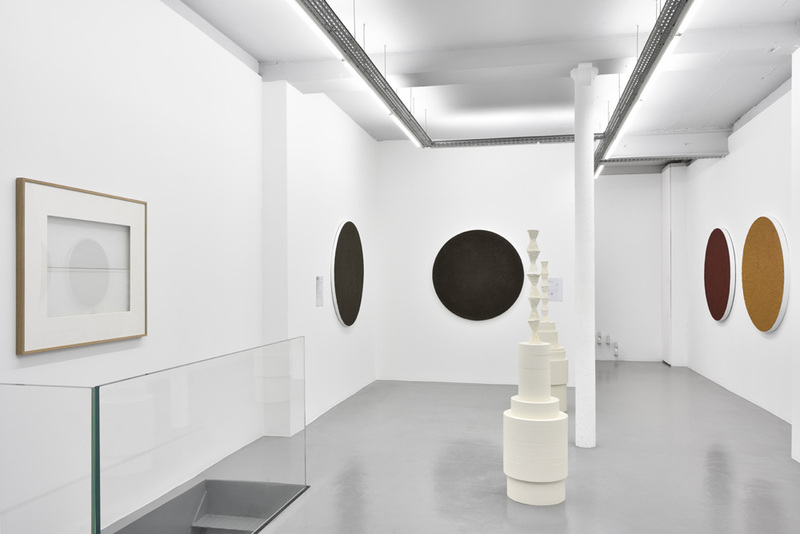 Nicolas Boulard ‘The Quiet Man’ Installation view at Galerie Eva Meyer, Paris, 2017.